Healthcare environments need to be designed to facilitate healing first – while at the same time considering issues such as patient safety, increasing physical, social and psychological comfort as well as operational efficiency of that facility and staff. Corbett Inc. is your resource for solutions that address all of the increasingly critical issues that need to be addressed when designing a healthcare space, and our client case studies are extensive. Healthcare spaces are more than just hospital rooms or waiting areas, they are opportunities to promote comfort, healing, and happiness for patients and loved ones. Ask us how we can help transform your healthcare space from a simple room to a piece of home. 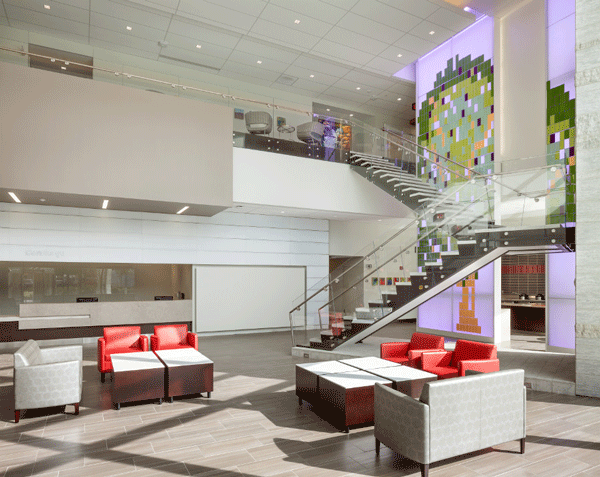 The Ruckus Collection fosters engagement between healthcare patients, providers and staff. Its innovative design promotes simple and essential movement, adapting to a variety of users and uses. Ruckus supports positional changes, encourages eye-to-eye contact and accommodates individual sitting styles. It's also a unique solution for staff and guest regeneration, providing comfort and versatility.